Arthur Cecil Pigou made lasting contributions to the science of economics, but for macro-economists of a certain generation he will always be considered a laughingstock. Professor Pigou taught at Cambridge University during the first decades of the 1900s, and had the misfortune of making a cameo appearance in the opening chapters of what is arguably the most influential economics book of the 20th century, The General Theory of Employment, Interest, and Money, written with eloquence, and at times a very caustic pen, by his colleague at the same university, John Maynard Keynes (whose last name, by the way, sounds like “Canes”). Pigou’s big mistake was to suggest that the unemployed themselves were to be blamed for their predicament. To Mr. Keynes, the notion that the persistently high unemployment rates of the Great Depression were in some sense voluntary was worthy of scorn and ridicule. In our times Paul Krugman, the Princeton University economist who writes a popular blog for the New York Times, treats “Austrians“, those arguing for a quick return to balanced budgets and small government, with much the same criticism Keynes levied on the hapless Professor Pigou. The case for austerity depends very much on your interpretation of the causes of unemployment. Keynes described writing his book as a struggle to break free of old habits of the mind, the most central of which was to treat human labour like any other commodity, bought and sold like copper or pork bellies in markets that equate demand and supply. From this perspective unemployment is simply an excess supply of labour caused by policies or attitudes preventing wage rates from adjusting as smoothly as prices do in any well-functioning market: at the root of the problem are unions, minimum wage laws and other government regulations and taxes, or simply envious workers, who might not have the skills or ambitions of others, but who nonetheless demand to be paid the same wage. If the unemployed were willing to work at lower wage rates, the problem would simply disappear. If unemployment is structural, then more government spending will not create jobs; it’s only going to compete with the private sector and shift bargaining power to workers. Before you know it a wage-price spiral will lead to higher inflation. Keynes saw in the unemployment rate data of the 1930s what they show today, a sharp run up that has persisted for years and years. Can this possibly be voluntary? In the 17 countries that make up the euro zone the unemployment rate shot up in late 2008, reaching over 10%, not improving for a year and half, and then even more remarkably rising since mid 2011 to now stand at over 12%, well above its pre-recession level of 7%. Things are not much better in the United Kingdom, with virtually no progress made in reducing the unemployment rate during the last four years. 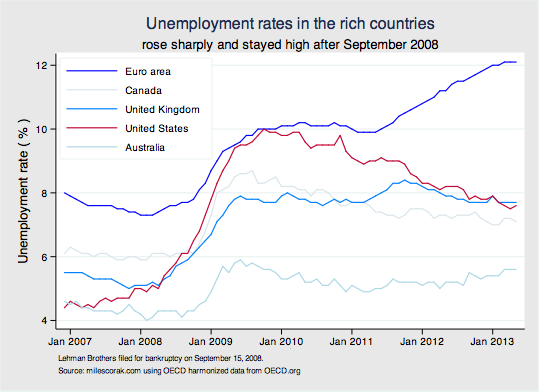 Nowhere has the unemployment rate returned to pre-recession levels, not even in countries benefiting from the bonus of a commodity price boom: not Australia, not Canada. And compared to pre-recssion levels the United States looks worse, the unemployment rate doubling to 10% at the onset of the recession, only declining sluggishly since January 2010. Austrians must convince you that high and persistent unemployment is somehow due to frictions in the labour market: workers are making excessive wage demands, they don’t have the right skills, they don’t want to move to where the jobs are, minimum wages or unemployment insurance benefits are too generous. To a Keynesian economist, austerity came too soon. This kind of unemployment is involuntary: unleashed by a locking up of the financial system, and sustained by continued pessimism. Cutting wages isn’t going to fix the problem because inflexible wages aren’t the cause. The ups and downs of unemployment reflect the inherent instability of an economic system driven by the confidence investors have that their decisions will pay off, all the time knowing the future is inherently uncertain. Tightening the public purse just makes things worse. 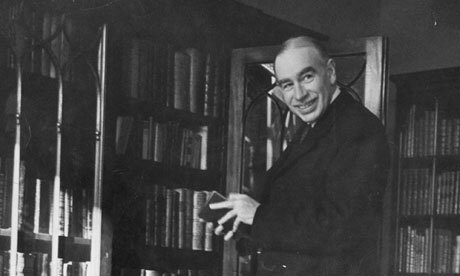 Ironically, Keynesian economics counsels us to do more, not less, of what got us into the mess in the first place: to collectively borrow and spend in the hope of giving the private sector a kick-start, generating jobs and incomes directly through government spending, which then induces more hiring and another round of spending, hiring, and incomes. The dynamics of the unemployment rate teaches us that Austrians are hard pressed to make an economic case against Keynesians, and the attempt to do so—to interpret unemployment as frictional and structural—can only be sensibly understood as a response to the political naivety of Keynes’s original thinking. Keynes longed for the day when economics would be seen as no more controversial than dentistry, a technical science that could fix the bugs in an inherently unstable economic system. He was as much a believer of running surpluses in times of plenty, as he was an advocate of deficits in times of depression. But politics is inherent to budget making, and the time horizon of politicians is often much shorter than the length of a business cycle. The temptation to spend at an unsustainable rate during the boom has historically proved too much for those with an eye on the next ballot. Not having confidence that governments can run surpluses during economic booms, you can see why some seem to be arguing for balanced budgets during economic recessions, and trying with all their might to convince us that unemployment is all structural. For if the electorate can’t be convinced with the simplistic and incorrect logic that governments should, like any family, tighten their belts when times are tough, how can they possibly be convinced when the good times roll? [ The title of this post is inspired by John Hicks’s 1937 paper interpreting Keynes’s theoretical model: J.R. Hicks (1937), “Mr. Keynes and the “Classics”; A suggested Interpretation,” Econometrica, Vol. 5 No. 2 (April). An abridged and slightly different version of this post appeared in The Globe and Mail under the title “Unemployment: Forced or voluntary? Financial crisis revives an old debate” on September 18th, 2013. I think it is a common mistake to think that Keynes (1936) believed that perfectly flexible wages would remedy what ails a market economy. It is true that early in his text he assumes a sticky nominal wage, but he clearly states that it is just a provisional assumption, made primarily for simplicity, that his main argument would hold even with flexible wages and that, indeed, flexible wages would only make the situation worse. David, you are absolutely correct. In the early chapters of the General Theory Keynes assumes sticky wages, but later examines flexible wages. My wording may not have been the clearest. The point I was trying to make was that Keynes was suggesting it was possible for the economy to come to rest when there is still unemployment, that the labour market was not self-equilibrating. Persistent unemployment was something believers in the classical economic model couldn’t get their head around; that if there was unemployment then there must be something preventing prices, that is the wage rate, from adjusting. I’ve added the sentence “Cutting wages isn’t going to fix the problem because inflexible wages aren’t the cause.” to the post to be absolutely clear on this. Nicely done and makes some good points that should be emphasized. In some measure, I don’t think you emphasized nearly enough the damage that the dogma of the virtues of smaller government has done. There is no real evidence that a smaller government helps bridge the debilitating effects of uncertainty and the crisis of confidence that is really constraining the recovery in Canada and elsewhere. Utter shite, drive down wages and get the uneducated masses working with just enough money to survive and keep them happy with cheap junk food and reality televison. Professor Corak, Pigou may not have been the best macro economist but as a micro theorist he was in a class on his own. Recall the famous Taussig /Pigou controversy on joint costs and rail way rates. But a point in support of reading the General theory again and again. Labor is demanded because the goods produced by labor are in demand. The goods when sold must compensate the producer for labor and material cost and also cover its fixed production cost .The selling price must further generate a surplus which is the rate of return on capital employed.. When goods are taken to market but remains unsold or cannot fetch a price which will provide the expected return on capital, then the producer must reduce his output . Capacity utilization rates will decline and investment spending will ultimately fall if this situation persists. Correspondingly the demand for labor will fall. The key issue is that of explaining this aggregate demand problem. Say’s law holds in a barter economy but does not necessarily hold in the market economy. Why does this demand deficiency remain for an extended period.? .The usual suspect is Investment spending. The chapter on animal spirits still remains relevant.. The free enterprise economy may be the most efficient around but it is not perfect. Look at what it did on account of the derivatives debacle. Greed is good to a point because it propels the search for profit and stimulates investment but beyond that point it becomes destructive, as it undermines the environment conducive to investment expansion by creating instability and uncertainty.. I really can not see how some macro economists fail to accept the potential instability of capitalism and recognize that like in 2008 the system can find itself in a very destructive and unstable path. Government is not always right but the market can also get it very wrong . Which suggests that we must always redefine and refine the role of the state in economic management.. I mean always. This to me is the central lesson of the general theory. . . Thank you very much Senator. I certainly did not mean to disparage Pigou’s accomplishments, which you so correctly state are many, but as you also note were in “micro-economics”–the analysis of the allocation of goods and services through markets and prices under the assumption of full employment–and not “macro-economics”–the analysis of the economy as a whole and the business cycles to which it is subject–which Keynes’s book gave birth. Austrians – or Austerians as the case may be must demonstrate nothing. It is the Keynesians whose policies have repeatedly failed and our doing so once again that have something to prove. If the cure for the economic hangover is the hair of the dog that bit you then why do we have no instances where this has worked. While Prof. Corak correctly notes that economics in the hands of politicians has little resemblance to that of blackboards and classrooms – that does not help. If you are going to offer economic input to public policy, then you have to accept the realities of politics. Whether Keynes might work in some hypothetical universe is if no import to the real world. In the real world actual austerity has worked, and stimulus has not. As to wages, in the current mess we have made much the same mistakes as during the great depression with much the same results. As to demonstrating frictions in the labor market – during the great depression, both Hoover and FDR used significant political capitol to compel employers to keep wages high – even if that meant greater unemployment. Today we have minimum wages, and nearly infinite unemployment with a wide and deep social safety-net. The unwillingness of labor to reduce wage demands even during a recession is rational behavior – given the public policy we have. Citing Krugman just demonstrates how far Keynesians have fallen. Though once a respectable economist, the modern Krugman has become a political shill who can be quoted to prove anything, and can not even defend himself against Ron Paul. Though he does get credit for dramatically increasing the profile of Austrian economics. Great piece! We can see how Austrian economics ties into Public choice theory. My view is that these theories point to real issues with state interventions. The problem is that using mechanical metaphors they can’t escape the conclusions brought upon by their premises. I feel like much of it is tautological. Saying that unemployment is caused by labour inflexibility is taking the projected solution (labour flexibility) for the cause of the problem. I may be wrong but I feel like I could just as easily say that the cause is the inflexibility of capital and I would be just as arbitrary. It seems like they are taking artifacts like real world political economies and treating them like natural objects. *clarification* Saying that unemployment is caused by labour inflexibility is taking the *absence* of the projected solution (labour flexibility) for the cause of the problem. Miles, Austrians such as Hayek and Lionel Robbins argued for austerity based on their business cycle theory that emphasised malinvestment that led to a collapse at the end of the monetary boom. Their theory of unemployment was well developed as anyone else’s in the 1930s. Subsequent work by Lee Ohanian, for example, and comments in the 1930s both placed emphasis on the prolongation of the great contraction by the new deal because of its cartelisation of the labour and product markets. in the UK, for example, both commentary in the 1930s and the work by Levis Kochin in 1979 emphasised the extremely generous unemployment insurance for adults (but not for teenagers and married women) and the difficulty of moving council houses between depressed and growing regions. This meant that adult unemployment rate in the United Kingdom was in double figures from 1920 onwards to about 1939. The unemployment rate teenagers was very low in inter-war Britain.